Massachusetts College of Liberal Arts’ action learning project will address this question: Do library instruction and outreach programs focused on sophomore students improve academic quality and student retention? During the fall and spring semesters, a librarian will partner with a faculty member to create course-specific assignments focused on research and information literacy. The librarian will visit the class to discuss research, be embedded into the learning management system, and schedule individual appointments with students. Our project will feature integrated instruction and targeted outreach to sophomores majoring in political science. Tying instruction to a class within their major will introduce students to key research approaches and sources and provide a foundation for success. If students succeed in their field of choice during the sophomore year, they may be more likely to persist with their studies. Team members from the Center for Student Success and Outreach (CSSE) and the Office of Institutional Research and Planning (IRAP) will lend expertise and amplify our outreach and assessment efforts. All four team members are invested in student success and will play essential and complementary roles. All members have good working relationships and share strong commitments to making the library an integral part of student success. The 2014-2015 academic year is an important time for assessing library instruction at MCLA – the College is currently reviewing learning outcomes related to information literacy in the majors. Our action learning project will allow the library to put in place an assessment of knowledge gained. We will also compare grades from the 2013 academic year with 2014 grades, survey students in the class, and review retention numbers for re-matriculating students. 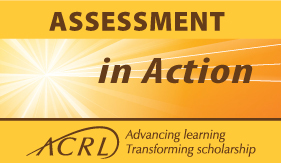 Participating in the action learning project would formalize our assessment of the impact of the library on student success and provide a strong base to expand to other academic areas. Librarians who participate in the AiA program, supported by a blended learning environment and a peer-to-peer network, will lead their campus teams in the development and implementation of an action learning project examining the impact of the library on student success and contributing to assessment activities on their campus. The projects will result in a variety of approaches to assessing library impact on student learning which will be documented and disseminated for use by the wider academic library and higher education communities.